This societal nexus nutshell, with humour and passion on serious rock, explains housing uniquely. It is for many; home-maker, sociologist, psychologist, economist, environmental practitioner, builder; whether mortgage perplexed or a simple enjoyer of digest. It introduces the industry and diverse, colourful people around encampment, boulevard, cottage, rooms, breadcrumbs and modern dwelling: for humans in a modern world. Houses are huge to world and home-maker. How do we manage it? How does it manage us? With us each is the activity interface that bonds us with domestic contraption; the activity of housing and the returning action of houses. "House” is more than architecture. Dweller in the driver’s seat; do your own special housing. Share in the perceptions of other experts, curriculum drafters and authorities commonly introspectively blinkered by their own streams of focus making decisions and blocking wholeness like naturopathy in western medicine or feng shui in western architecture. The book is offered at least to architecture and college students as a guard against the blinkering silo effect. The students need to be on fire of their own generational movement! And knowing the indigenous and the nomad have held us in hand eons ago while today they are surveyed into a corner. Read it all easy down-home as by an architect off an organised cuff. Anecdotes, technical and poetic allusions, recalled from a well-read and design experienced mind. Crack the mystiques of design, bureaucracy and the built. Find the lay person in the heart of the professional and professional in the lay. 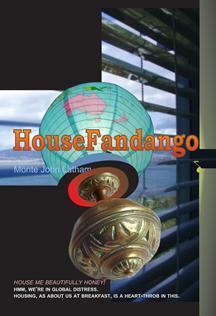 “House Fandango” is a phenomenon – the product of an exuberant creativity, a mind ever restless, fluid, alert to manifold possibility, uncontained. Such an intelligence might change the world. We need to listen to John Monte Latham, then. His is a wisdom that roams wide and free, at the same time as it focuses down upon the most urgent question of our age: how should we live, how should we dwell, how should we be? Here is the dance of people and place – a veritable house fandango, and its dancemaster steps us forth from the very earth, its magic, the bedrock on which civilisation rests, to the place-nurturing, self-nurturing, self-constructing activity that is nothing less than making a home on earth. Come with John – dance his dance of life-affirming love.